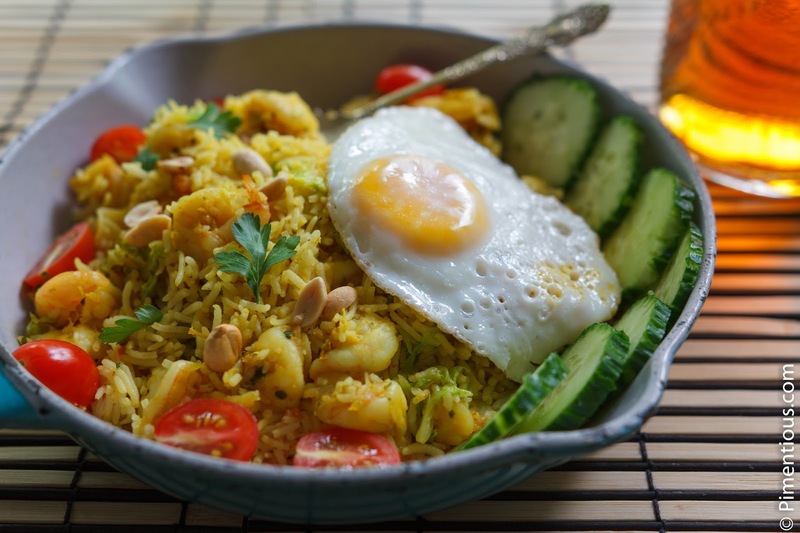 I noticed that I have not yet uploaded my version of the classic nasi goreng altho I cook it at least one a month and my favorite topping is fried salty anchovies (teri goreng). I remember whenever we were having nasi goreng back at my parents home, there were always two batches of nasi goreng : one with ketjap manis for the fanatic ketjap lovers like me, my bro and my dad, and one without ketjap manis for the incomprehensible group of people who doesn’t like ketjap manis, like my mom. As a ketjap enthusiast, I can only take a classic nasi goreng seriously when ketjap manis is involved. It is what makes the nasi goreng looks darker and tempting. Is ketjap manis has always to be used in nasi goreng? No, not really actually. Infact, every region in Indonesia has their own version of nasi goreng using different spices and uses no ketjap, like this Balinese nasi goreng I am making today. As you can see from the picture, Balinese nasi goreng has this bright yellow color instead of dark brown like a classic nasi goreng. It comes from the fresh turmeric I put in it. 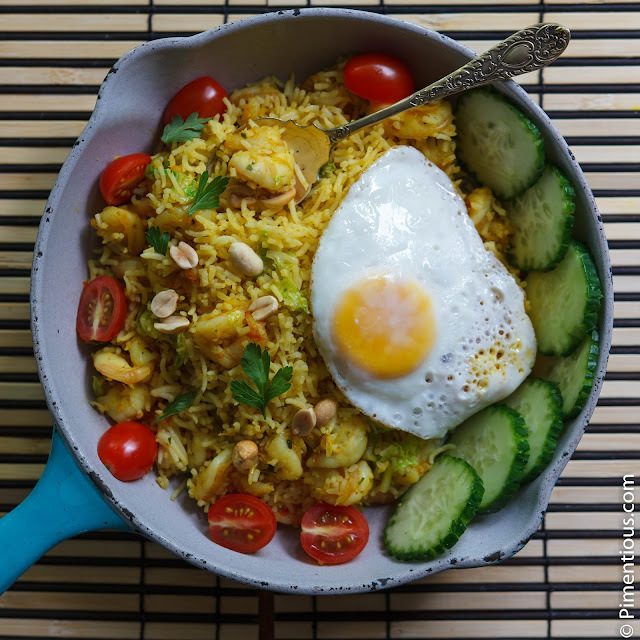 This nasi goreng tastes completely different from the classic nasi goreng. Very aromatic and spicy! Yumm!! Is nasi goreng a breakfast thing? No, (altho you will find this dish at breakfast time in 99% of hotels in Indonesia). In fact, we can have it in restaurants at any time of the day. In Jakarta, there is even a line of street hawkers that peddles through most of the streets selling nasi goreng as a midnight snack (they only start to peddle after 9PM). We call them Tukang Nasi Goreng Keliling (fried rice street peddlers, literally). And yes, I had my favorite nasi goreng peddler that passed right after the national news on tv. No matter how many portions they’ve served before passing in the front of my house, they'd always pop up on my porch on time. They were magically punctual, indeed. They pass way more regularly than my period. Add rice, turn up the heat and mix thoroughly. Add salt to taste and sugar (if you use any). Mix thoroughly once again, continue cooking until the shrimp turns bright pink. Take out the lemongrass and spoon the rice onto serving plates. Decorate with toppings. Thank you, share hasil percobaannya nanti ya. Sedikit masukan; shallot yg saya gunakan disini lbh besar dr bawang merah Indonesia, jadi mungkin kalau menggunakan bawang merah Indonesia, jumlahnya diperbanyak 2-3 kali lipat.